Dielectrics (insulating materials for example) when subjected to a varying electric field, will have some energy loss. The varying electric field causes small realignment of weakly bonded molecules, which lead to the production of heat. The amount of loss increases as the voltage level is increased. 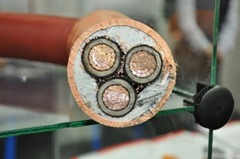 For low voltage cables, the loss is usually insignificant and is generally ignored. For higher voltage cables, the loss and heat generated can become important and needs to be taken into consideration. Dielectric loss is measured using what is known as the loss tangent or tan delta (tan δ). In simple terms, tan delta is the tangent of the angle between the alternating field vector and the loss component of the material. The higher the value of tan δ the greater the dielectric loss will be. For a list of tan δ values for different insulating material, please see the Cable Insulation Properties note. Note: in d.c. cables with a static electric field, there is no dielectric loss. Hence the consideration of dielectric loss only applies to a.c. cables. It is possible to use the above for other conductor shapes if the geometric mean is substituted for Di and dc. MIT OpenCourseWare, makes the materials used in teaching all MIT subjects available on the Web, free of charge, to any user in the world.